Full coverage of the big Lost Mills event, which is happening this week at Brombachsee, Germany. There’s $33,000 on offer which has attracted several of the world’s best paddlers, including Connor Baxter, Travis Grant and Jamie Mitchell. 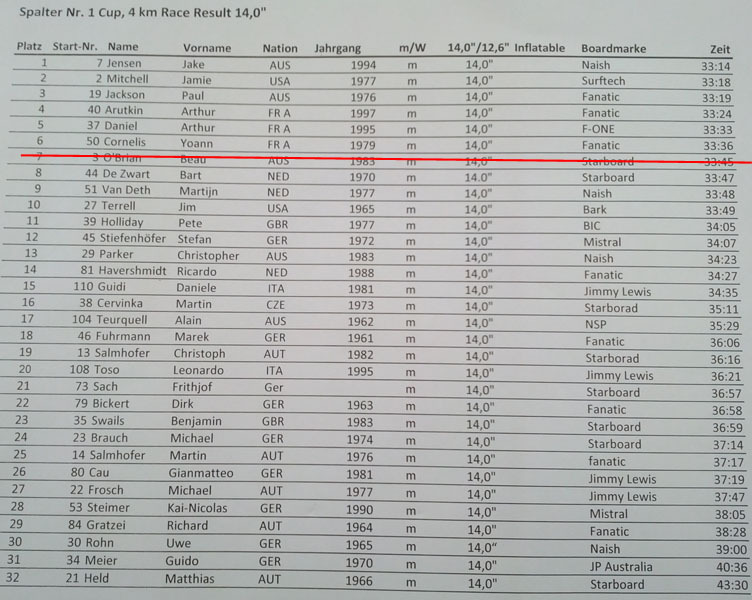 DAY 3 UPDATE: Holy crap… Eric Terrien is a machine!! 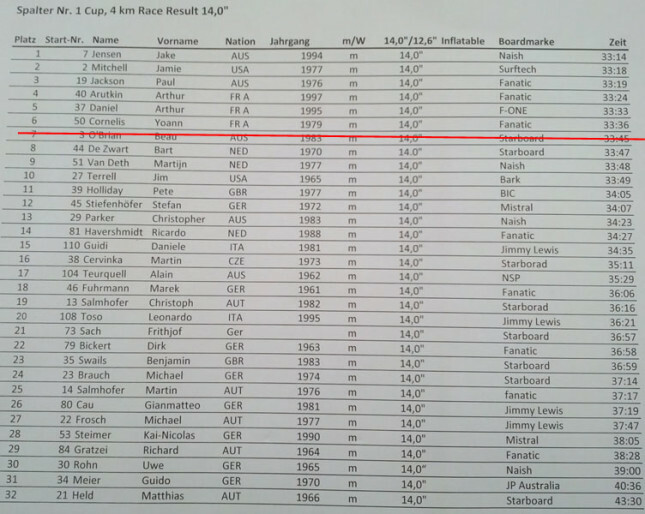 The Frenchman led from start to finish in today’s main event; the 18km Lost Mills International SUP Race. 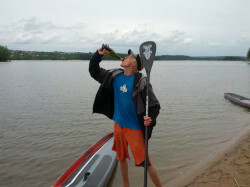 Not only was he leading the entire way, he was doing it on his own… Eric broke away early and literally paddled all by himself for the entire race. From my vantage point back in the pack, I kept looking up and waiting for the chase group (which featured many of the world’s fastest paddlers) to catch up. But they didn’t. 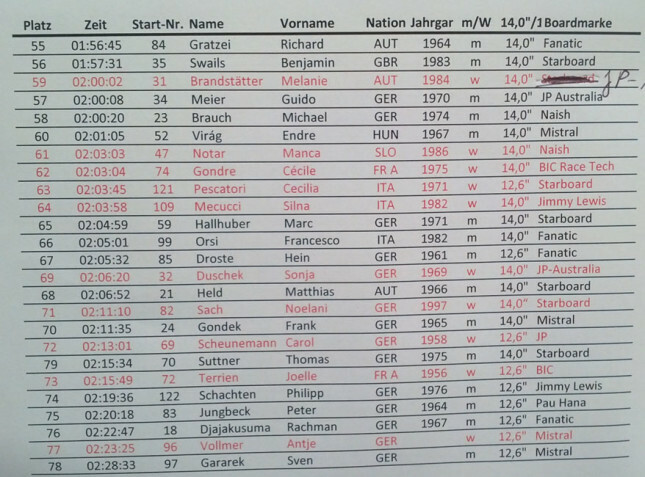 Instead, Eric kept extending his lead more and more. Eric crossed the line probably two minutes ahead (we’ll have full times shortly), while Connor was 2nd, Travis 3rd, Casper 4th and Chase 5th. Scroll down for the early results and check back soon for full results. FULL RESULTS from today are now posted below. 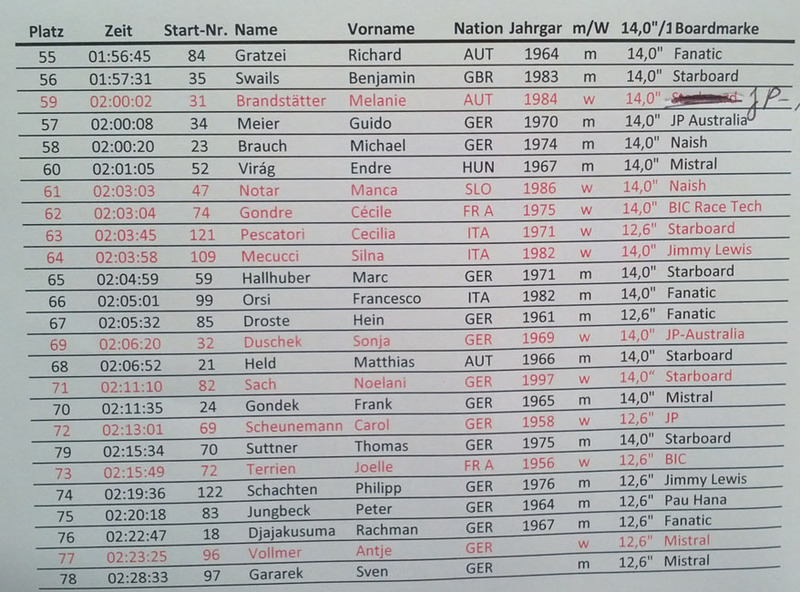 Sonni Hönscheid took out the women’s ahead of Kriszta Zur and Angie Jackson. 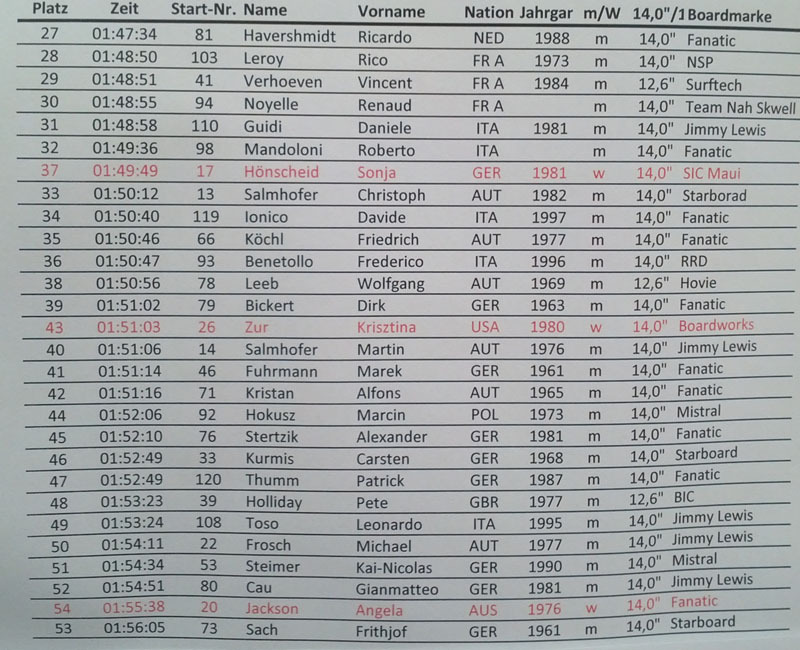 Gruelling race… total mind game. I have NO IDEA how Eric managed that… Awesome work buddy! DAY 2 UPDATE: Morning update… We woke this morning to grey skies and pouring rain, which delayed the start of the 4km “Spalter Cup” (it’s a beer brand…) until midday. We’ve just finished that event and it was an Aussie trifecta in the men’s, with Jake Jensen winning ahead of Jamie Mitchell and Paul Jackson. In fact it wasn’t just an Aussie trifecta, it was a Currumbin trifecta; these three guys live within a 5km radius back home on the Gold Coast. 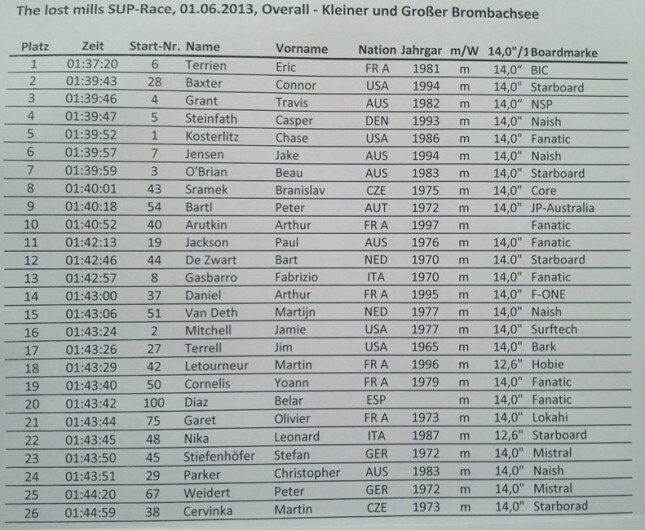 Afternoon update… The Jamie Mitchell Survivor Race has just wrapped up and again it was Connor Baxter who took the win, with Travis Grant second and Beau O’Brian third. Krisztina Zur won the women’s event to keep her unbeaten streak alive, while Angie Jackson was runner-up. 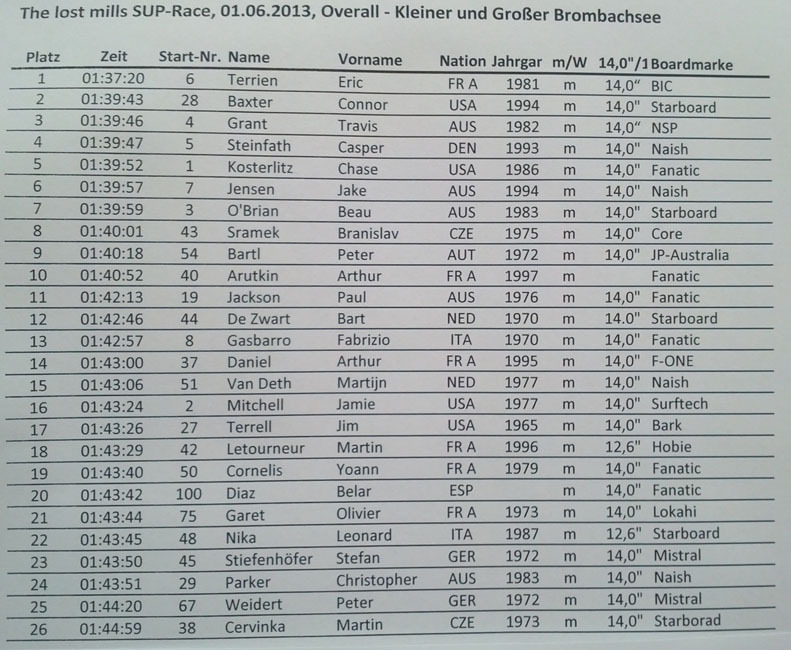 DAY 1 UPDATE: Connor Baxter drew first blood at the 2013 Lost Mills race in Germany, claiming today’s “The Fastest Paddler On Earth” time trial event. 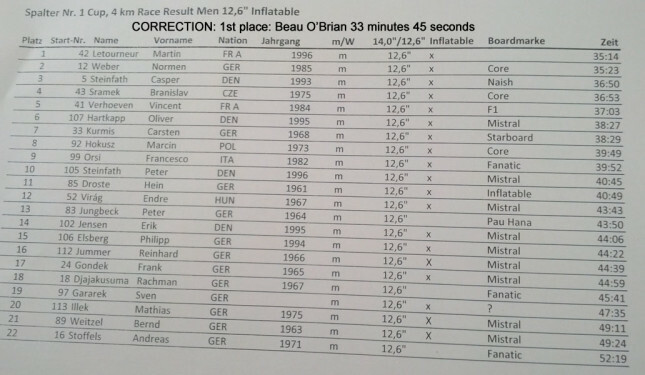 Eric Terrien was 2nd with Aussie Beau O’Brian 3rd. 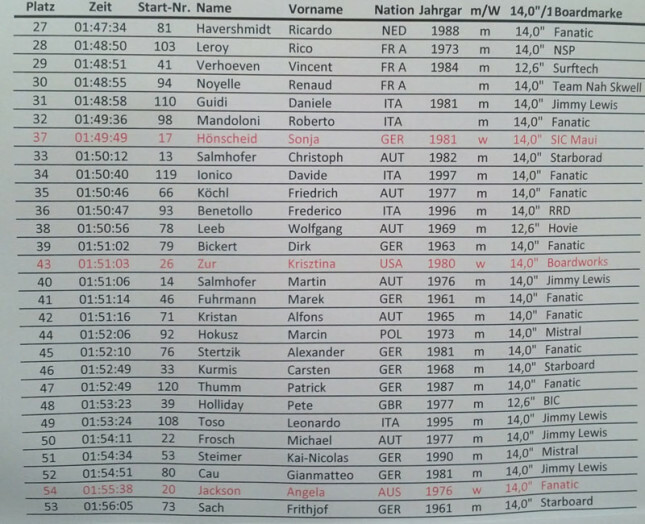 Meanwhile Olympic Gold Medallist Krisztina Zur took out the women’s race ahead of Sonni Hönscheid and Angie Jackson. Despite the chilly weather, this unique new format produced a fun day on the water. 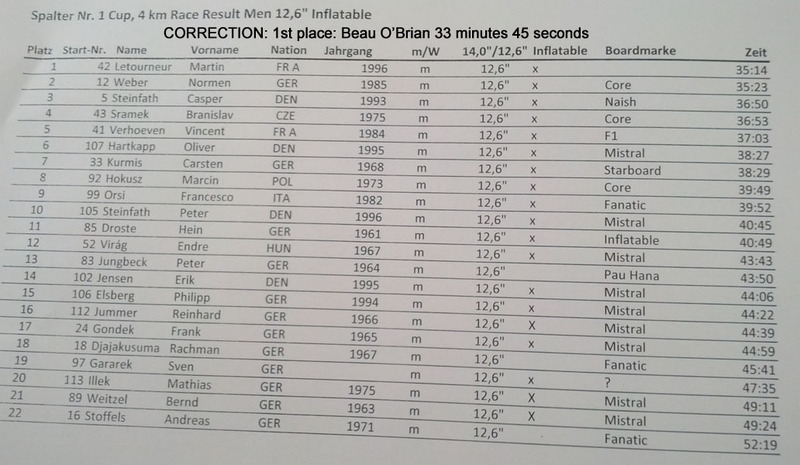 Paddlers were racing the clock, not each other, as they paddled down the 200 metre, straight line course, which had electronic timing gates at each end. The pros were doing it in less than a minute..! The race also produced plenty of prizes, with Connor taking home a $7,000 Breitling watch and the total prize pool for this event alone sitting at $12,000. And this is just day one… this wasn’t even the main event! We’ve still got two more days of racing and $22,000 in cash to hand out. Gotta love Germany! Full recap coming soon but in the meantime check out some photos plus FULL RESULTS from today’s finals. 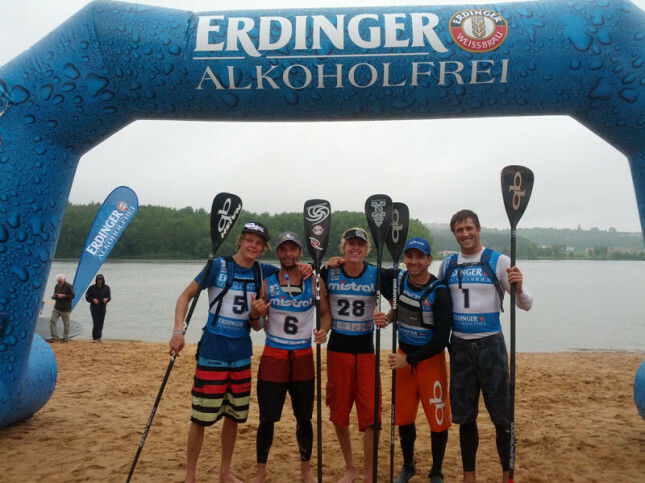 In case you’ve been living under a rock lately; the Lost Mills is a big SUP race happening in the middle of nowhere in Bavaria, Germany. 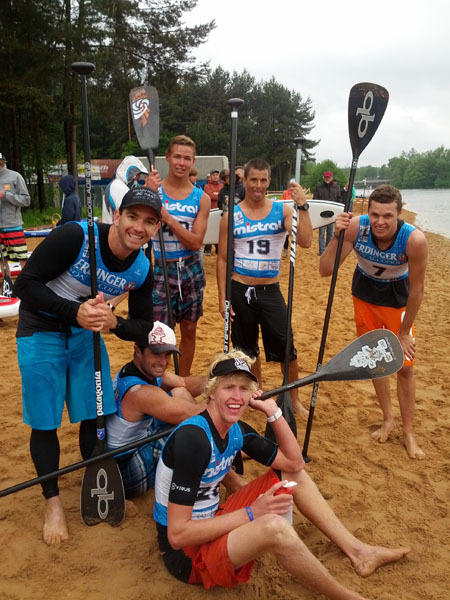 It’s offering $33,000 in cash & prizes and has attracted a whole stack of the world’s best international paddlers. It’s also event #2 on the completely unofficial but totally awesome “European SUP Racing Tour presented by NSP“. The level of organisation at this event is insane, the Germans are really taking it to the next level. Just check out the shots from inside the tent… it’s like Oktoberfest with a bunch of lucrative SUP races on the side! Epic!